It has been a month now since we officially opened Silid Aralan’s KIDS Toy Libraries in Kasiglahan Village Elementary School, San Jose, Rodriguez, Rizal. 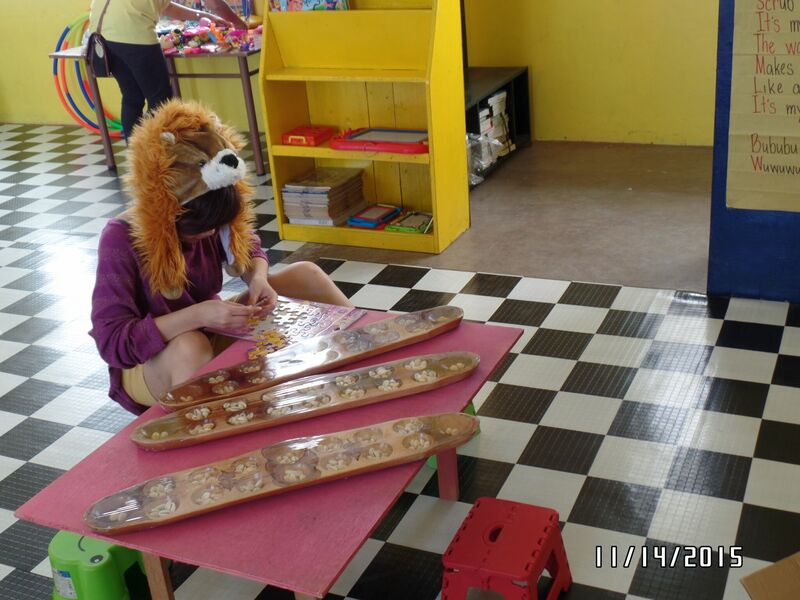 On that same day, we turned over the management of the toy libraries to Silid Aralan so that the learners can use them for playing and learning. The learners have strong desire to learn and to make their lives better in the future. SAI – introduction of methods and strategies for children to learn how to love learning. Each toy library was designed and arranged into different sections or areas that can help the children discover their passion and critical thinking. The reading area is intended for helping the learners strengthen their imagination using different types of books. The creative area is equipped with toys such as building blocks, puzzles, board games, as well as doodle boards, crayons, and pens to encourage the learners express their creativity and artistry. The play area is filled with various toys for learners to enjoy as kids. More Toys to Enjoy at the Play Area! I was so happy when I saw the two rooms. The set-up with lots of toys and books are what the learners really need. They need it not only because they will learn from it but also it will satisfy their needs as a kid. We all know that at their age they are playful. Honestly, living here in Kasiglahan Village I saw children playing on the street. Their toys were tin cans, bottles, broken things, in short trashes. Kasiglahan as we all know is a depressed area, a relocation site. Most of the families came from the informal settlements in Metro Manila. Aside from this, some children were scolded by their parents because they want them to earn money by collecting and selling trash instead of playing. I am not saying that all learners are in that situation, but I know that one or two dream to have a decent toy to hold and play with. I believe it will give an impact to their life, it will create dreams, imagination, and satisfaction. The moment our learners saw their room on the first day, their faces brighten with smiles and joys . They were so happy! It was a big big surprise for them. At first I let them do what they want to see their reactions. They took the toys and books that they want. As I watch them, I told myself that the happiness that I see at that moment is something that no amount of money can buy. Priceless! Some took the puzzles, dolls, balls, and books. Others played inside the tents. I noticed that the toy or book they picked reflects their heart as a learner. One can also see their passion which they sometimes hide in their daily environment due to lack of support or poverty. Our learners are NR (non-reader) students and underprivileged. That day when they saw their new rooms filled with toys and books, they felt they were also given the chance and freedom to live as children. I believe that day, the joy and freedom they felt will remain in their hearts forever. We also received some notes from the learners themselves sharing their thoughts about their new rooms. English Translation: The classroom is beautiful, lots of books, lots of toys. I am happy while reading. The classroom is clean. English Translation: The learning hub is beautiful. clean, organized, and very new. The learning hub is colorful, beautiful, and has lots of toys and books. English Translation: What can you say about the learning hub? Colorful and a lot of things to read and play. 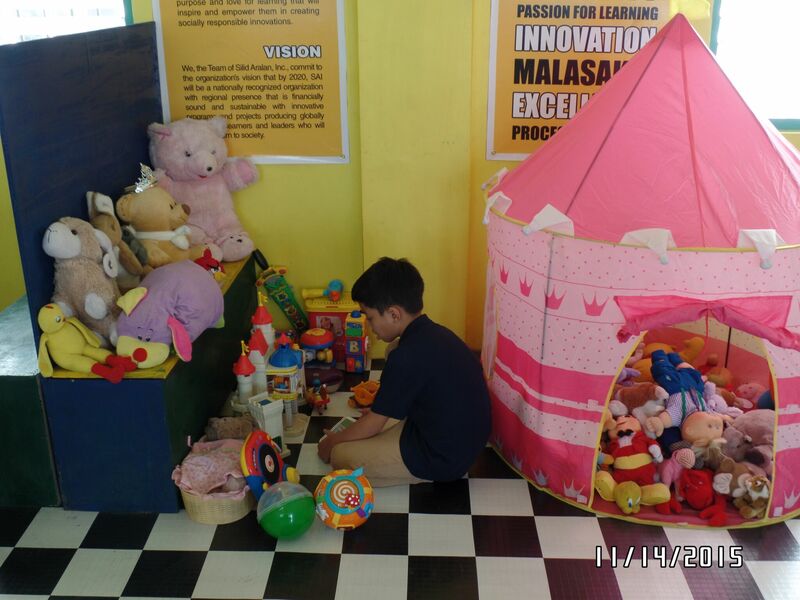 Last 14 November 2015, Silid Aralan’s KIDS Toy Libraries were officially opened for the children to use and enjoy. KIDS Club President Evalyn Evangelista and Ms. Ninya Saquilabon from PTL led the ribbon cutting of the two rooms. With them were members of KIDS Club, parents, volunteers, and the children. After that, KIDS Club had a story-reading time with the kids. Mr. Alex Alfonso also taught the children some simple mathematics strategies to help them appreciate numbers more. Simultaneously, Ms. Saquilabon conducted a brief introductory workshop with the parents and volunteers to orient them on the management and maintenance of the toy libraries. We thank all our families, friends, and colleagues for helping us make this project a success. We hope that you will continue supporting us as we try to replicate this project in other areas. ← It’s An Early KIDS Christmas! !